Amazing performance and beautiful design, the H911 is a super fun and durable helicopter for intermediate pilots. A slight upgrade from the V911 helicopter, the Pro edition comes with several upgrades including: stronger landing gear, lighter canopy, and improved tail motor. Massively popular and insane flight performance packed into a small and affordable helicopter. Nothing comes close to the V911 helicopter. A must have for any intermediate heli pilot. The S108 is modeled after the Super Cobra attach helicopter. 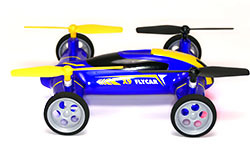 One of a few realistic looking rc helicopters that are incredibly easy to fly! Highly detailed to maintain the beauty of the Apache helicopter and with amazing durability, the S109 by Syma is a quality rc heli that is the favorite of everyone who owns one. The S111 is a highly detailed replica of the Coast Guard Airwolf helicopter, very easy to fly, and affordable! Able to withstand a lot of crashing! The Syma S026 Mini Chinook is a cool double rotor rc helicopter that is easy to fly. Just add batteries to the remote and start flying! The S107 is the perfect beginners rc helicopter. 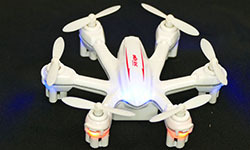 Incredibly easy to fly, very durable, and affordable. 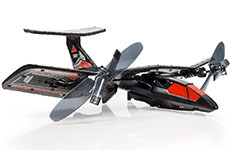 If you’re new to rc helicopters, the S107 is a great start. Very easy to fly Black Hawk rc helicopter. Syma did a great job with this high quality, very stable helicopter. 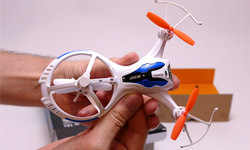 The Syma S6 is the smallest RC Helicopter on the market. It’s durable, surprisingly fast for it’s size, and will provide those much needed breaks from work or school! The Syma F3 is an intermediate helicopter that offers great performance, a low price, and some upgrades over it’s competition; the V911. Makes an awesome backyard flyer. 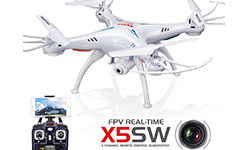 This great performing quadcopter comes with a camera that has built in WIFI that will connect with your smart phone so you can fly FPV! One of the most stable and best flying quadcopters for it’s size and price, the HS170 is a really well built machine! This quadcopter drives like a car on the ground and seamlessly takes flight as a quadcopter. The Syma X9 flying car is awesome! Incredible performance packed into a tough tiny body, the Cheerson nano quad is one of my favorite toys I own! Giant and super easy to fly, the WLToys V262 is a versitile quadcopter that is a great buy for many reasons. Loaded with features normally only found on more expensive RC quadcopters, the Syma X5C delivers a ton of value for a small price. Very durable beginners rc quadcopter with cool ducted fans and 3 flip modes. My first and favorite medium sized quadcopter. Amazing performance, fun to fly, and durable. Perfect for learning and flying outside. 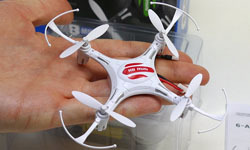 Not the first nano Quad Copter on the market, but that’s because the Syma x12 improved upon all it’s competitors. Sturdy and well designed! Nano Quad Copter with more power than it knows what to do with. This fun little Quad zips around at impressive speeds but isn’t super durable. Palmed size super performance mini quadcopter. Might be too fast for beginners, I would recommend this to anyone who’s looking for an upgrade from a slower quadcopter. One of the most durable Quad Copters! The cage allows it to roll on the ground and ceiling. The ultimate beginners toy. 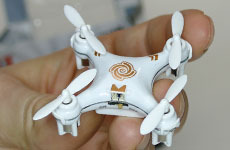 The is the worlds smallest hexacopter. It handles just like a quadcopter and sounds like a swarm of angry bees! Starting at $22 for the standard quad and $40 for the HD camera version. Quality design, replaceable batteries, great flight performance, and lots of upgrades usually only see on more expensive quads. Sleek and stylish, this is one of the most impressive looking Quad Copters.The Hubsan X4 mini Quad has an optional HD Camera! 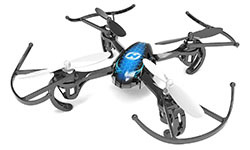 A nano quadcopter with headless mode and good stability, the CX-10A is a quick intermediate quad. 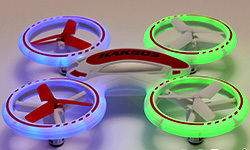 Bright LED lights eliminate every side of this easy to fly quad. The HAK 905 has a durable easy to see frame with 3 bladed props. Small and stable, the Syma X2 offers a lot for a small price. The X2 will do 360 flips with ease. Great indoor quadcopter. A very different look then most other quadcopters. It handles like a quadcopter with a few little exceptions. This medium sized quadcopter has a fpv camera that broadcasts a wifi signal so you can view what the quadcopter sees from your smartphone. 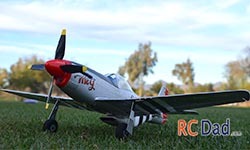 The “SAFE” technology makes this RC plane very easy and fun to fly. Beginners and advanced pilots will love the price and performance of the Sport Cub S.
An outstanding mini glider, it doesn’t get much better than the UMX Radian. Easy to fly, long battery life, affordable, and you can even mount a camera on this thing! A great way to learn how to fly. A simple 2-channel flying car will have even the most beginner pilot flying in no time. It’s how I learned to fly! 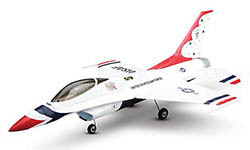 This Ultra Micro rc plane combines scale beauty with high performance all for around $100! Full 4-channel intermediate park flier. The Hobbyzone Duet is a great park flier. If you want an easy to fly RC airplane and don’t have a lot of space to fly, then check out the Duet! Hovers like a helicopter and flies like an airplane. Low performance but it’s unique and easy to fly! 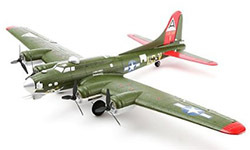 Ultra Micro B17 bomber with 4 working motors and 4 channels. Could you ask for more? It also comes with AS3X stabilization and landing gear! 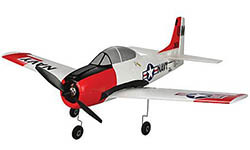 This Ultra-Micro RC Jet is screaming fast and is a great first ducted fan plane. Comes with a brushless motor, AS3X, and is plug and play ready! This Ultra Micro war bird is great for flying in small spaces! Full 4-channel control and great performance.